FORE! Heads up, it’s that time of year again. All you Mike Weir and Sammy Snead hopefuls are shining up your clubs in anticipation of the coming season. However, like your clubs, you have developed a little rust over the winter months. Before you charge out there in pursuit of your first birdie putt of the year, there are a few things you may want to consider. Prevention of injuries is the best way to ensure that you’ll be able to enjoy an entire season of golf. How important is a strong and healthy back? : Your golf swing, and hence your entire golf game, is dependent on your spine. It is the spine and its associated musculature that generate the majority of power used in the swinging motion. Due to the high forces involved in the swinging motion, many golfers experience back pain or discomfort. Building and maintaining a strong, flexible, and properly functioning body core can help you avoid injury. Don’t forget your knees and feet! : Proper fitting shoes with adequate arch support are essential. 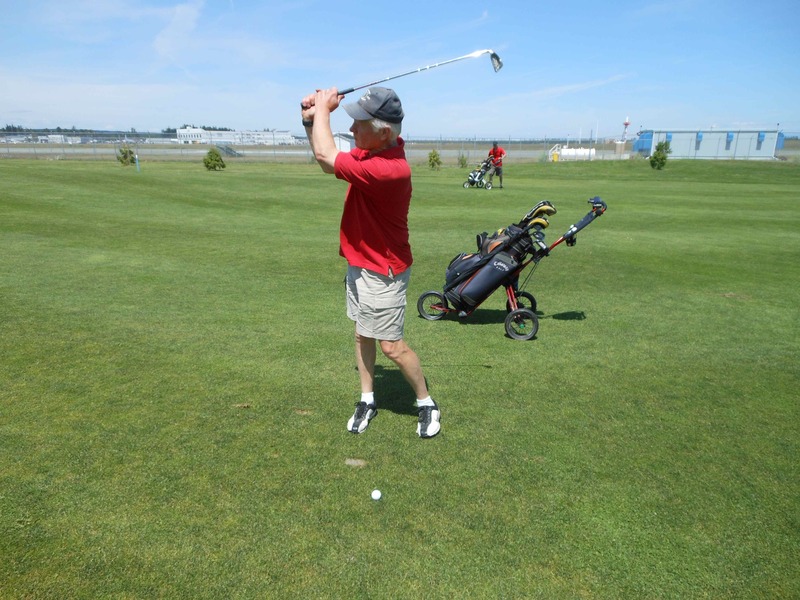 Even if you are talented enough to keep the ball in the fairway most of the time, you are still covering a tremendous distance on uneven ground when you play a full round of golf. If the weather is dry and warm, consider wearing your running shoes for a game once in a while to ensure you have the comfort and support you need. If you have a pair of prescription orthotics, use them in your golf shoes. How do you transport your clubs around the course? 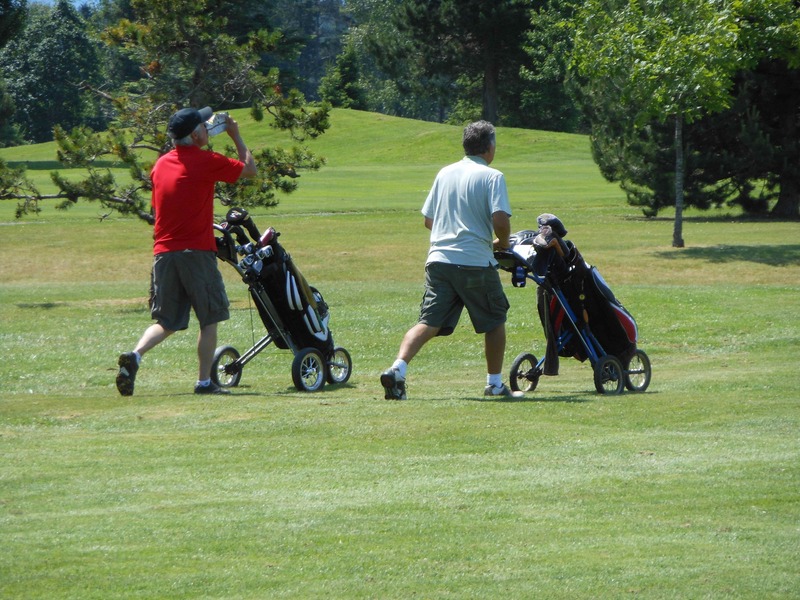 : Handcarts are the best choice to transport your clubs around the course as they avoid adding stress to your spine. However, if you prefer to carry your clubs, select an ergonomic bag with dual padded shoulder straps and have the bag set up specifically for you. This will help to distribute the weight of the bag equally across both of your shoulders and your back. New Clubs? : If you have purchased a new set of clubs, whether they are brand new or second hand, it is worth having a professional fit them to you. Setting up proper shaft length and club head angles can help preserve proper posture and prevent sprains, strains, muscle spasms, or other such injuries. Now that you have this perfect set of clubs, how can you lift them out of your trunk or pick-up box without hurting your back? : The answer is, carefully. Make sure you exercise proper lifting technique: keep your back straight, bend with your legs, pull the golf bag in close to your body, then use your legs to lift the bag out and set it on the ground. Do you stretch before you hit the links? : It is good practice to arrive at the golf course at least 20 minutes before your scheduled tee time. This time can be used to stretch out your body and warm up those tight muscles. Hitting a bucket of balls is a good idea, however you still need to make sure you are warmed up and stretch before taking a full swing. Do you have a stretching routine? : If you have a stretching routine that works well for you then stick with it. If not, then here are a few generic stretches that may help to loosen you up. As a general rule, all stretches should be held for a duration of 30 seconds with steady tension (no bouncing motion). Start your stretches gently and slowly. As your body warms up, so will you. If you are carrying a few extras pounds, dedicate yourself to losing them. Extra weight in the midsection weakens the abdominal muscles and places additional force on the spine. When you address the ball, do not stand so far away that you are stretching to contact the ball. This places high stress on the lower back and diminishes the power you can generate in your swing. During your swing, keep your knees slightly bent. This causes the abdominal muscles to contract, strengthening your low back. Slow and steady wins the race. A relaxed swing will help you address the ball more accurately. Hitting the sweet spot with a slower precise swing is more likely to keep you in bounds than swinging for the stars. This will save your back, your supply of balls, and in the end, your score. If all else fails, take some lessons from a professional. They will help you tighten up your swing and avoid bad or potentially dangerous habits. Reference: Randal Heimark DC and the Canadian Chiropractic Association, 2002. The majority of power developed in a golf swing comes from your core, which is directly dependent on your spinal flexibility and core muscle strength. Injury prevention in golf requires continual maintanence of these structures. Spinal check-ups are a great way to avoid injury and ensure that you will be able to enjoy your entire season. To make sure that you are lined up, call your Comox Chiropractor, Dr. Rick Houlgrave.